Last week, I hobbled over our frozen lawn toward my salt-encrusted car, balancing a to-go cup of coffee and two bags slung over each shoulder. It's a hassle running errands during the doldrums of winter. Opening the gritty driver's door, I set my coffee in the center console's cup holder, then decided to hurl my purse and tote bag across the driver's side into the passenger's seat. Of course, my purse strap caught the handle of the to-go cup as it flew over the console, splattering coffee on the seats, windows, dashboard, floor mats, and my white winter coat. "Gimme a break," I mumbled, subconsciously referencing the spring getaway that would get me through the God-forsaken winter. This year, Francis and I are taking trip to the British Isles to see our daughter, who is spending a semester abroad. A rented London apartment will serve as home base during most of our trip, but we will also explore the Irish countryside for four days, with only a rental car and a GPS to guide us. Though excited, bad memories of relying on a GPS during a spring break trip in Italy 10 years ago have me worried. I was driving our kids from our German duty station to Venice, to board an Italian cruise ship for one final hurrah before we moved back to the states. In Austria, I stopped on the side of a winding mountain road because Lilly was carsick, hoping our GPS would lead us to our hotel soon. We squealed around three more hairpin turns before spotting our Tyrollean guest house. "There it is!" I yelped with relief. The owner showed us to two rooms at opposite ends of the hall. After eating the dinner I'd packed for us, we were snug in our respective rooms. Anna and Lilly's huge bed looked like a giant coconut crème pie mounded with feathery white cotton. I drifted off in the room I shared with Hayden, thinking of the fun we would have during the days to come. "Mom, Lilly threw up in our bed!" Anna startled me in the darkness. I stumbled to my feet and followed her down the hall. Opening their door, I found complete carnage. The marshmallow white bed had turned into a veritable crime scene. The half-digested dinner of turkey subs, sour cream and onion chips, and M&Ms was pooled in the center of the crisp white linens. In an attempt to mitigate the damages, Lilly had dabbed the mess with a bath towel, managing to slop it on herself, the carpet, the bathroom floor and two light switches. I stood for a moment, unable to contemplate a solution. Obviously, Lilly wasn't carsick. She had a stomach virus. For two hours I scrubbed, scraped, rinsed, dipped and squeezed away the horrific mess. I found clean linens in a hallway closet and put poor Lilly back to bed. In the morning, I left an apology note and some extra cash on the stained mattress and set the GPS to take us the "fast route" straight to our cruise ship in Venice. But instead of sending us to the nearby freeway to the south, our GPS directed us east, into the snowy mountains. Believing that our GPS knew better, I did exactly as instructed. An hour later, we were 2,000 meters above sea level. Another hour later, police signs directed us onto a dirt detour around an avalanche covering the road. Then, after making it through the Alps, we crossed into the Dolomites. Was this a sick joke? 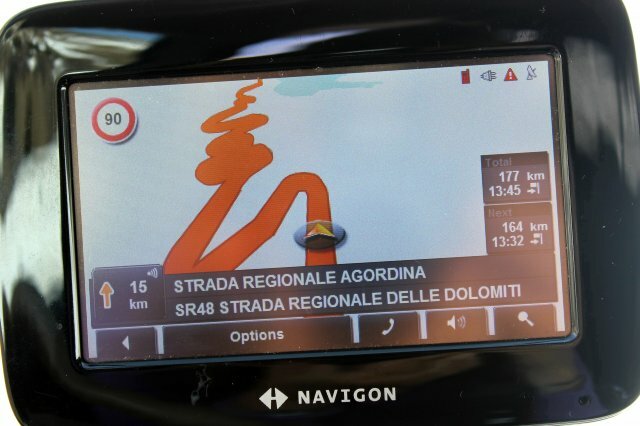 After four hours of zigzagging mountain roads, our GPS finally released us onto a straight highway toward Venice. I snatched the ticket from the toll booth and gunned the engine, racing at illegal speeds. Every time our smug GPS warned, "Beware!" and flashed the speed limit, I gritted my teeth and pressed the gas pedal harder. I arrived in Venice frazzled, but satisfied that I'd taken two full minutes off our GPS's estimated time of arrival. Take that! Technological advances in the last decade make another GPS-related spring break incident unlikely in Ireland, but I'm bringing a map, just in case. Guam Diner Bytes: iHop's coming! But where do we park?